Uniform is worn by all students except members of the Sixth Form (Years 12/13) who have their own reasonable code of dress. 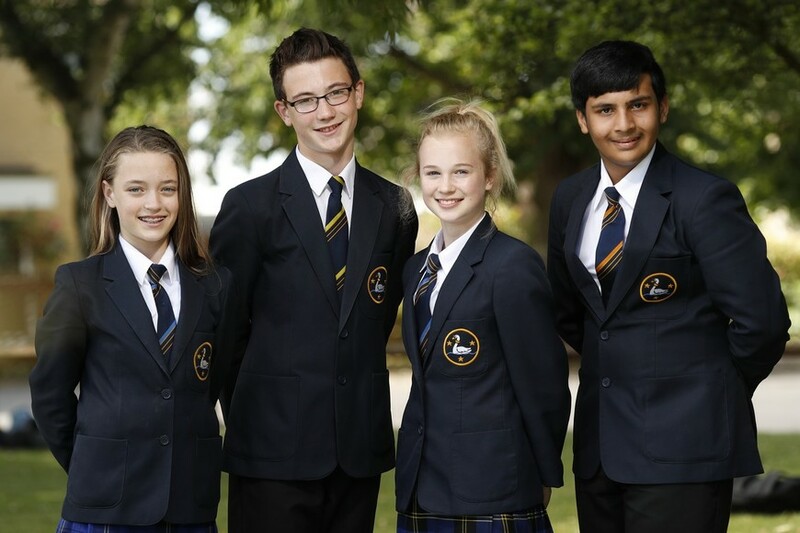 Parents sending their children to Chelmer Valley do so with the understanding that the established uniform is a requirement of the standards we expect and maintain. We INSIST on the full school uniform at all times. A school is often judged by the appearance of its students in public. The reputation gained by the school as a whole is of importance and value to the individual both during school life and later when seeking to enter employment. A good standard of uniform helps to set the tone of our school. It also identifies the student with the school. As clothing can be an expensive item we have tried to keep the list to a sensible minimum and place our emphasis on colour and simple style. We are happy to see parents in individual cases where, particularly for religious reasons, this code may need to be discussed. Parents also need to be aware of current health concerns relating to the sun's rays and the degrees of protection items of uniform can offer. School Uniform can be purchased from our official uniform stockists, Pope & Smith Sports Ltd of Moulsham Street, Chelmsford. The school requires the student to be fully equipped for all lessons. Pens, pencils, ruler, scientific calculator, geometry set, coloured pencils and eraser should all be included in your child’s pencil case. Students need their own plain red cotton drill apron. This can be purchased from the school. It is understandable that students and parents are pressurised into buying items of clothing according to the latest fashion trend. Children come to school to work hard and learn in a safe secure environment and the notes below should clarify many situations. If in doubt ring the school for clarification. Unless there are very special circumstances students who do not meet our uniform code will be internally excluded. All students must carry a Uniform/Equipment Card at all times. Infringements are noted on the card and sanctions include after school detentions. a) It is removed for all practical lessons eg Science, Art, Design Technology, and hung up. b) It is removed for energetic play at lunchtime and break. FOOTWEAR - The school is anxious to comply with the 'Health and Safety Code of Practice' and to minimise the possibility of serious injury to children's feet, particularly in practical subjects. Trainers are to be worn during recognised PE activities only. Shoes (not trainers) are to be worn whilst travelling to and from school and during school hours. If alternative footwear is required for medical reasons, a doctor's medical note must be brought to school. Low heeled means the heel should not exceed approx. 2 inches (5 cm) measured at the back. There have been instances where children have fallen when a high heel has caught in steps. There is also now evidence to suggest high heeled shoes can cause lower back damage in later life. OUTDOOR 'COATS' - plain, navy or a neutral colour. 'Fashion' coats, leather or denim do not comply with requirements. All Outdoor wear should be removed on entry to classrooms. No badges or slogans. JEWELLERY, VALUABLES & MAKE UP - NO MAKE-UP OR JEWELLERY/NAIL POLISH, FALSE NAILS or other items the school deems inappropriate. With the exception of watches which can be worn in school. Valuable items should not be brought to school. Students with pierced ears may wear one pair of SMALL silver or gold studs or SMALL sleepers (one piece per ear lobe) but NOT during PE lessons. As a guide small sleepers should not exceed 1cm across. Make up is not allowed unless for exceptional medical circumstances. Items used to tie hair back should be unobtrusive. Hair:- dyed an unnatural colour, short cropped (number 1 and 2). No skinheads. Studs and Rings etc (except one stud in each ear lobe, nowhere else). MARKING OF CLOTHING - All clothing and other personal property should be clearly marked with the owners' name. We recommend the name is "sewn in" the clothing item. SCHOOL CODE OF CONDUCT - Compliance with school uniform is part of the school code of conduct. Failure to comply with the uniform guidelines may result in your child being internally excluded from normal lessons. You choose Chelmer Valley High School because you believe in its aims, policies, practices and values. We look forward to working with you in upholding our standards. WELL DRESSED STUDENTS - Just wearing the correct uniform does not mean students always look well dressed. We insist that students wear their uniform with pride and keep it clean and smart. For example, blouses and shirts should be tucked in, ties worn properly with the top button done up and shoes clean. It is recognised that certain religions and beliefs require their adherents to conform to a particular dress code. This could include for example covering their head. The school permits the safe wearing of the Hijab (Islamic head scarf) in the colours of navy blue or black in line with the school uniform policy. Should students have other uniform requests relating to religious beliefs, they should contact the school directly. The item will be confiscated and given back at the end of the day. If the issues persist the period of confiscation may be extended. If it is impractical to confiscate the item a letter will be sent home explaining the part of the uniform which is incorrect. The student will be given a certain amount of time to amend the issue (i.e. buy shoes trousers etc. if required). If after this time nothing has changed the student will be sent home and a meeting will be arranged with parents/carers to discuss a positive way forward.